Taking a pause on the discussion of the further past to focus on news from the more recent past...and the future. First, the recent past: this past weekend I was thrilled and delighted and very, very honored to win the Best Paranormal Romance Award for Skin Deep in the 2016 Golden Leaf Contest, sponsored by the New Jersey Romance Writers chapter of RWA. Here’s my pretty award (and a gold leaf pin)...but the best part was how I found out that Skin Deep had won. At the awards ceremony held at NJRW’s annual conference, it’s the tradition for the wonderfully talented NJRW member Anne Walradt to read aloud a sample from each category’s winning book before the title is announced—and wow, can that woman read. So when it came time for the Paranormal category winner to be announced, I was completely taken aback—then blown away to hear my words so beautifully read. 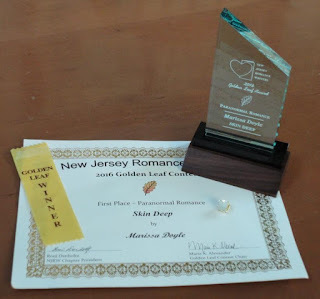 So a sincere thank you, NJRW, not only for the award but for Anne’s wonderful reading. And in future news, I’m very happy to announce that my adult contemporary fantasy By Jove will be coming out in a new edition on February 7, 2017 from Book View Café. Stay tuned for details (the new cover is in the works!) over the next few months. Okay, back to the past!